Since I was a little girl I always loved face masks. I'd always beg my mom to let me get a Freeman mask from the drugstore and whenever she obliged, I was obsessed with doing them a few times a week. When I think about that, it's no surprise that I turned out to be a beauty blogger and work in the beauty industry. That being said, face masks are definitely one of my favorite skincare products and probably my top 5 favorite beauty products ever. There is something so calming about laying in bed with a face mask on your skin and being able to fully relax while also helping your skin heal. Nowadays there are face masks for pretty much every skincare concern you could imagine. Maybe it's not technically a skincare concern but you taking a preventative measure like using an anti-pollution or anti-aging face mask. I have dry, sensitive skin so I do use face masks that cater to those concerns but I also love a great pore removing/detox mask. I don't discriminate against face masks -- I love all kinds! I've been testing more and more face masks out and figured I'd round up my current favorites/most used/most repurchased. These masks will all fall within one of those categories. *I am sticking to face masks -- not hands, eyes, feet, etc. 1. Ole Henriksen Cold Plunge Pore Mask: This is a new mask that I only got a few weeks ago but I've never used a mask so much! I've used it every week, at least 1-2 times since I got it and I'm obsessed. I notice a slight difference in my skin but ultimately it feels really great on your skin. The effect afterward is even better -- the cooling and minty sensation on your face when you remove the mask makes it well worth it. 2. Peter Thomas Roth Irish Moor Mud Purifying Black Mask: I've had this mask for a few years and oh my goodness, this is the best face mask ever. It removes all the gunk from your skin while leaving it smooth and refreshed. Whenever I want to do a face mask but I'm not sure which one I want to do, this is my go-to. It's a mask that I 100% will repurchase when I'm done with it because it's something that I simply cannot be without. 3. Fresh Rose Face Mask: This is my ultimate hydration mask. Whenever my skin needs a tall glass of water, I ultimately go to this one. It's a very lightweight mask that has rose petals mixed into it (which is divine and makes for a great masking experience) and truly leaves your skin smooth and supple. It's much more than a mask -- I feel like it's a toner and lightweight moisturizer all in one. It's incredible and I highly recommend picking this up! 4. Drunk Elephant Baby Facial: This is a mask/treatment that has gone viral and is in many people's holy grail baskets. Well, it is THAT good! Drunk Elephant is bringing serious skincare into your home, without the help of a doctor and in perfectly beautiful Instagram worthy packaging. They've basically given us all the gift of a facial in a bottle -- and it's a facial that exfoliates and resurfaces the skin with the use of AHA and BHA, two important skincare ingredients that I recommend doing research on. My skin looks incredible after using this and I have to really limit myself because you shouldn't be using this more than 1-2 times a week. 5. Hey, Honey Take It Off Exfoliating Honey Peel Off Mask: I was on the hunt for a fun peel off mask that worked and I found it! This mask from Hey Honey is equally as fun to put on, peel off, and leaves your skin looking baby smooth. It exfoliates the skin, removes dead skin cells and blackheads and leaves your face brighter, smoother, and softer. It's such a good mask and great for all skin types. I highly recommend! 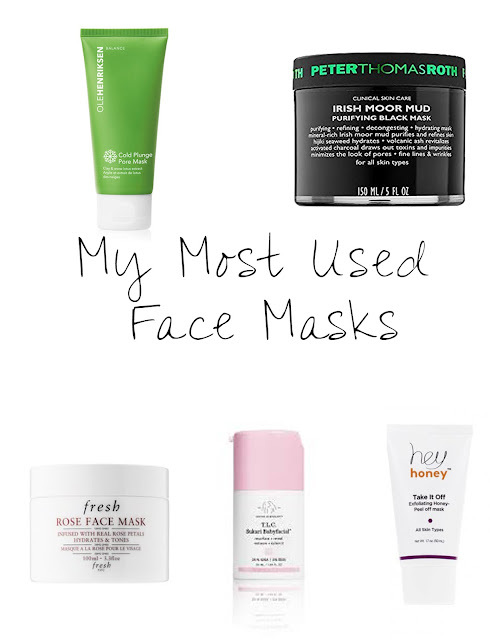 What are your favorite face masks right now? If you have any recommendations, leave them in the comments!